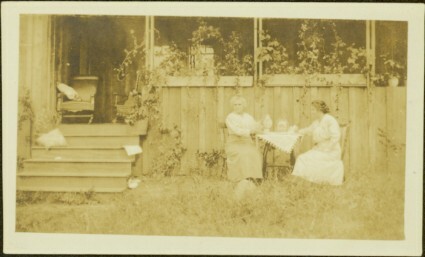 Two women sit at small table in front yard of large house, woman on right believed to be Sarah Glassey. Pillows, chairs, and plants on porch in background. Handwritten annotation on recto: "Mrs. Bradbury, Myself taken when I was sick. Her house in Saanich." Handwritten annotation on recto of photograph: "H73".